Answer : Its an artifact, known as truncation or Gibbs artifact, as axial T2w images planned at right angle to cord at multiple levels are normal including sagittal T2 images repeated with increase in image matrix and lowering FOV. 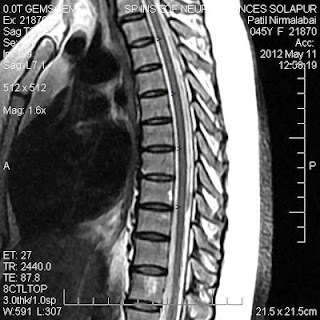 Interpreting thoracic spinal cord on MR sometimes can be challenging because artifacts due to pulsations of CSF as well as respiratory motion can project over the spinal cord on T2WI. The artifacts from CSF pulsation can be minimized with the addition of flow compensation techniques, and the nearby fat can be suppressed using STIR or saturation bands. There is, however, one other artifact that can contribute to artifactual high signal in the spinal cord called a Gibbs artifact. This is attributed to the difficulties of replicating the sharp changes in contrast between adjacent structures like cord and CSF using limited frequency information. While large data sets will allow a closer approximation of the edge, with limited time and data there will be some “truncation” of the information. This artifact is most evident where there are sharp contrast borders and a coarse matrix is used for the image acquisition. It cannot be entirely eliminated, but it can be minimized by using either a smaller FOV ( Field of view) or a larger and finer matrix. It is not seen often today because fast spin echo imaging and high field scanners has allowed the use of a finer matrix without consuming too much time. As the matrix increases and the pixels are therefore smaller, this artifact is minimized because the transition at any high contrast edge is spread over more pixels. When the Gibbs artifact is visible, it is located in the exact center of the cord as continuous faint high signal intensity line of uniform thickness on sag T2. Dilation of the central canal or a small syrinx generally should not be mistaken for a Gibbs artifact. A syrinx tends to be more sharply defined, more hyper intense and is evident on both T1WI and T2WI axial imaging. In Demyelination or Ischemia, cord involvement will be focal, multi focal or diffuse, axial T2 sections can be used for confirmation. This artifact was named after the American physicist J. Willard Gibbs, who was called “the greatest mind in American history” by Albert Einstein. He became a professor at Yale in 1871, so his work predated NMR by nearly 100 years. There is some irony in attaching his name to this artifact since his life’s work focused on the mathematics of what is now called thermodynamics.